This is a slightly different version of a sweet and sour “Chuck & Bung”. I really like the warmth from the chilli and using the pineapple juice makes this a really juicy family meal. Try it – you will love it! 225g can Water Chestnuts, Drained. Put oven on to 200C/ 180 fan/ Gas 6. Chop the chicken into bite size pieces using Forged Cutlery Knife on the Cutting Board. Add to the Rectangular Baker. Using a knife, peel the onions and cut into quarters. Finely chop using Food Chopper. Add to the Rectangular Baker. Using a knife, cut the peppers into 3cm pieces. Add to the Rectangular Baker. Crush the garlic directly into the baker using the Garlic Press. Add freshly ground pepper using Grinder. Open Pineapple tin using Smooth Edge Can Opener. Drain the pineapple using Stainless Colander pouring juice into Easy Read Measuring Cup. Using large Adjustable Measuring Spoon add 4 tbsp of corn flour to Classic Batter Bowl. Add 3 tbsp of pineapple juice and mix to a paste using Mini Mix ‘N Scraper. Using Mini Easy Read Measuring Cup and both Adjustable Measuring Spoons add all remaining ingredients (except for rice) into the Batter Bowl. Add the sauce to the baker. Mix together using Small Mix ‘N Scraper. Place in oven for 30 mins – until bubbling nicely. Boil full Kettle. Using Large Easy Read Measuring Cup add 2 cups of rice and 4 cups of boiling water to Rice Cooker Plus. Place in Microwave for 15 mins or until all the water is absorbed. This is a really, really tasty risotto that even my meat-loving family enjoy!! It is also really, really easy because it is another “Chuck and Bung” recipe where all ingredients are chucked in the Stoneware or RokCrok and then bunged in the oven… no stirring required at all! Using Food Chopper, finely chop onions and celery. Slice peppers and mushrooms with Utility Knife. Place in Large Micro Cooker with the butter, put lid on and microwave on high 2 mins. Take out and stir. Cook on high another 2 minutes until vegetables are softened. Measure stock and wine in Classic Batter Bowl and add with rice and vegetables from micro cooker to Deep Covered Baker or RokCrock. Press in the garlic with the Garlic Press. Slice cherry tomatoes in half and stir in with sun dried tomato paste and a grind of salt andpepper. Put Deep Covered Baker in oven for 40-45 mins until rice is cooked. Stir in grated cheese and spinach. Shave over remaining parmesan with Garlic Slicer and drizzle over a little olive oil. My blog has developed into having 2 purposes. The original reason that I began writing was to have an easy reference place for my Pampered Chef customers to find as many brilliant Pampered Chef recipes in one place as possible. Along the way a secondary, and very pleasing, purpose has blossomed into life. My 2 eldest girls are now 11 & 13 years old and I have realised that I really do need to get on with teaching them how to cook before they get up and leave home!! So, this blog has also turned into a repository of recipes that I make so that they can learn and make our favourite home recipes. So, this is how you find a Jamie Oliver recipe joining the Pampered Chef ones! This recipe is a really simple one pot recipe and, in the (longed for!) summer months is a great recipe for courgettes which allotment owners will appreciate! 400g pasta (whatever shape takes your fancy!) I use Wholewheat pasta for the extra fibre. 1. Boil a large pan of salted water and cook 400g pasta , following pack instructions. 2. Slice 250g Smoked streaky bacon and fry in a Family Skillet (large frying) Pan until golden brown. Slice 2 cloves of garlic using Garlic Slicer and add for the last minute or so. 3. Slice courgettes lengthways into quarters and cut into chunks. Add to the frying pan and cook for a couple of minutes with the bacon and garlic until they are slightly softened. 4. Once the pasta is cooked, drain in a colander, then put back in the pan. Add about half a tub of crème fraîche, some freshly ground black pepper and a handful of grated Cheddar. Mix together. 5. Gently fold the bacon and courgette mixture into the pasta and grate the remaining cheese on top. Filed under Bacon, Cheese, Cream, Easy Cooking, Family Cooking, Garlic, Jamie Oliver, Microplane Grater, Pans, Pasta, Quick Cooking, Super Quick cooking! 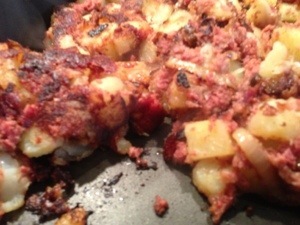 Corned Beef Hash… Why have I never made this before? Soo simple and so tasty!!! Peel, dice and boil potatoes for approx 20 mins. Meanwhile gently fry onions in some butter and oil until starting to change colour. 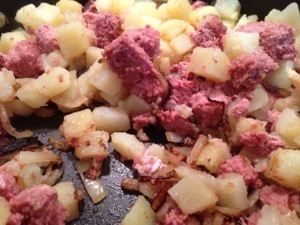 Add cooked potatoes, diced corned beef, good splash of Worcester Sauce and seasoning to onions. Fry until a crust is formed on the outside. Serve with green beans and/ or peas. Filed under Pans, Potatoes, Super Quick cooking! Susie's Recipes · Recipes that I use and love!